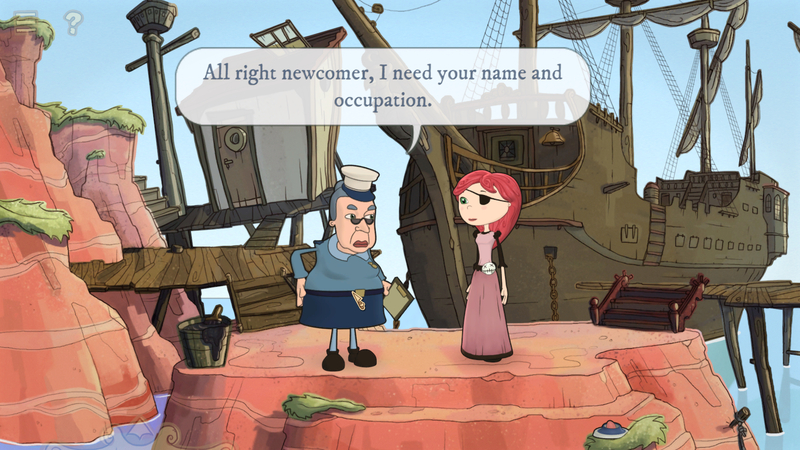 Nelly Cootalot: The Fowl Fleet is a new adventure game from developer Alasdair Beckett-King and publisher Application Systems Heidelberg. Application Systems has published a ton of games, which you can check out here. The game itself, however, was largely created by Beckett-King; he was the writer, animator, and even provides a few voices. It began as a Kickstarter, which raised £20,076 from 1,039 backers. There was also a first game in the series: Nelly Cootalot: Spoonbeaks Ahoy!, which I really want to play after playing The Fowl Fleet. You can absolutely play this without having played Spoonbeaks Ahoy! (I did). There are references dropped to that game, but not in an obtuse way. If you haven’t played it and you like this, you’ll probably be intrigued enough to go back. The plot is pretty simple, but motivating in a way that fits Nelly’s personality (she loves birds…and treasure). It’s a family-friendly adventure game, but also definitely one that can be enjoyed by people of any age. 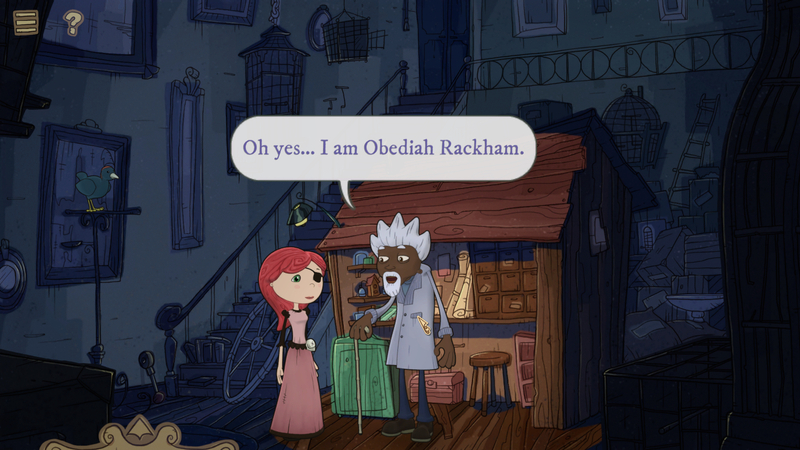 Nelly herself is a great main character – she has a sense of humor that reminds me of a dryer Guybrush Threepwood, and she’s quite likeable. The whole game is witty and very cute; I felt good when I was playing it. The one thing that made me groan was an arrow to the knee reference. I also appreciated that there were a lot of women and people of color in the game. The graphics are beautiful and extremely colorful; the game looks like a cartoon. The backgrounds are flat but also incorporate depth by putting objects in the foreground. Some of the characters are ever-so-slightly 3D, including Nelly herself, but not to the point of distraction. It’s a wonderful game to look at. All the characters have unique designs, and the backgrounds have a TON of detail. The map you get once you make it to the main town is really nice. The voice acting is also excellent, and of special note is that Tom Baker provides the voice of Sebastian, Nelly’s faithful bird sidekick. There were a few times where I took special note of the sound design, like when the voices echoed when we were in a cave – that’s a nice touch that not every game thinks of. There are even a few songs in the game, and would it really be a pirate game without a few shanties? I think not. They’re pretty catchy too! There is full voice acting in both English and German, with subtitles in English, German, Spanish, French, and Italian. There are also some accessibility options present: one button mode, anti-seasickness (which will make it so the ships don’t bob on the ocean), and a dyslexic font option. Without turning on the one-button option, left clicking interacts with objects and talks to people while right clicking examines. You can hit the spacebar or the question mark in the top left corner to reveal all clickable objects, which is always a welcome feature to avoid pixel hunting. The inventory hides on the bottom of the screen until you need it. The puzzles were mostly logical, and I only had to look at a walkthrough a few times. Even when I broke down and looked at the walkthrough, I kicked myself once I knew the solution; there’s no moon logic here. My favorite puzzle was gathering clues to figure out which of two identical-looking people was an impostor, which was a deviation from the standard inventory puzzles of the genre. There are also a few mini-games, which are always fun to see in an adventure game. You can consult with Sebastian if you need any hints on what to do next, and he’s helpful without being either obtuse or too obvious. You can fast-travel in the main town with the help of the map, but it’s also small enough where you might not need to do that all the time. There are twenty Steam Achievements, and they’re a good mix between story-related and exploratory. It took me five hours to complete the game. 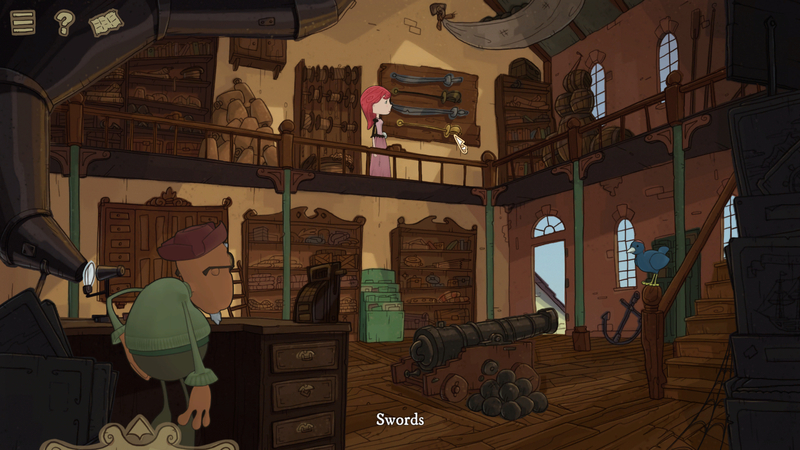 I had a lot of fun with Nelly Cootalot, and I recommend it for anyone who loves point-and-click adventures, birds, and/or pirates. I only wish it had been longer! Make sure you stay after the credits. 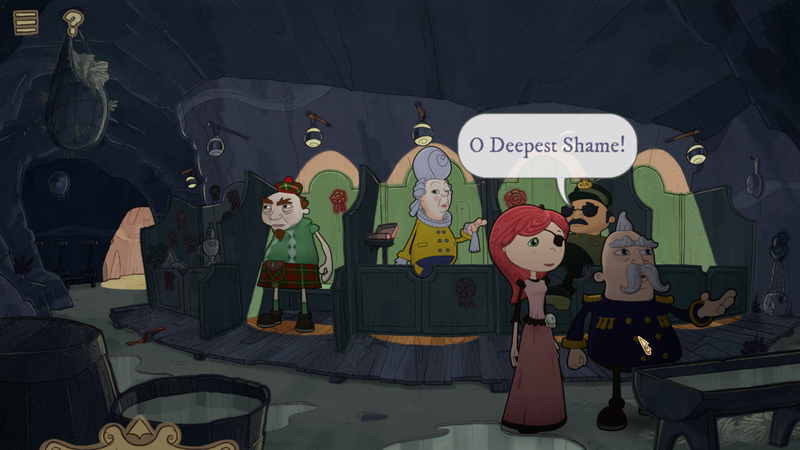 You can get Nelly Cootalot on Steam and a whole bunch of other places for $19.99, including directly from the devs. Follow the game on the official site, Facebook, and Twitter. You can also follow the creator on Twitter here and check out his website here.